A large building (belongs to the Frederick County Board of Education and has 27,000 sq feet) has been secured for a Frederick, MD based Art-O-Matic and the event, in all its glory, buzz, impact, detractors and career-making opportunities for artists is expected to take place in historic downtown Frederick in the fall. I hear that Frederick artist Steven Dobbin and crew have the lead for this project. I also hear that this will take a lot of leads and guidance from the DC area ArtOMatic. Also, of special note - Frederick, MD was just rated the 8th top small town arts destination in the country; Congrats! This kind of event may certainly spike that number! 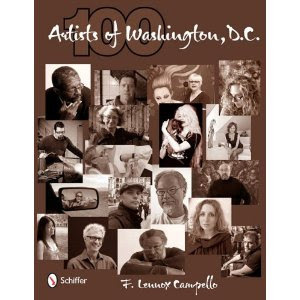 The 100 Washington, DC Artists book is almost here! I am told by the publisher that the advances arrived on Monday and that I will get an advance copy by next week, as for arrival in the warehouse for distribution, they have it slated for arrival on or about June 30th.